Gerry Anderson, the creator of hit TV shows Thunderbirds, Stingray and Joe 90, has died aged 83. Gerry Anderson also created Captain Scarlet and the Mysterons and his puppet superheroes fired the imaginations of millions of young viewers in the 1960s and ’70s. 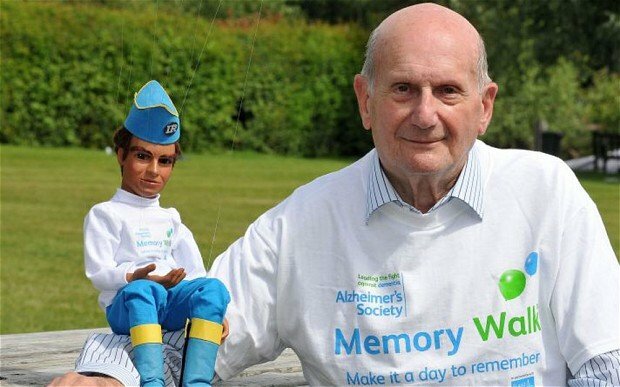 Gerry Anderson had suffered from Alzheimer’s since 2010 and the disease had worsened in recent months, his son Jamie said. Jamie Anderson announced the news on his website, saying his father had died peacefully in his sleep at noon on Wednesday. “Gerry was diagnosed with mixed dementia two years ago and his condition worsened quite dramatically over the past six months,” he wrote. Gerry Anderson talked publicly about the onset of the disease in June 2012. Gerry Anderson, who lived in Henley-on-Thames, Oxfordshire, began his career studying fibrous plastering, but had to give it up when it gave him dermatitis. Commissions were few, however, so he responded eagerly to the opportunity to make a puppet series called The Adventures of Twizzle in 1956. It was eight years before Thunderbirds came into being on ITV. The story revolved around International Rescue, a futuristic emergency service manned by the Tracy family, often assisted by Lady Penelope and her butler, Parker. It included the catchphrase “Thunderbirds are go!”. The show marked the career apex for Gerry and his wife Sylvia, who had honed their “supermarionation” technique on Fireball XL5 and Stingray. Nick Williams, chairman of Fanderson, the Gerry Anderson appreciation society, described him as “a quiet, unassuming but determined man”. “His desire to make the best films he could drove him and his talented teams to innovate, take risks, and do everything necessary to produce quite inspirational works,” he said.